I love meals that Mike and I can work on together. Translation – he can grill. I also love meals that are fairly easy to prep. Souvlaki was just that! I served this with homemade pita bread and some Greek salad for the perfect meal. So, quick, give this meal a try before it gets too cold to grill! I swear we’re only a couple of weeks away from our first snow. In a large non-reactive bowl, whisk together lemon juice, olive oil, soy sauce, oregano, and garlic. Add pork, onions, and green pepper to the marinade and stir to coat. Cover and refrigerate for 6 hours or overnight. Thread pork, onion, and green peppers onto skewers. Lightly oil grate. Cook pork for 10 – 15 minutes, turning once. Categories: Dairy Free, Gluten Free, Main Entrees, Meat, Pork, Special Diets | Tags: main dish, meat, onion, pork, vegetables | Permalink. 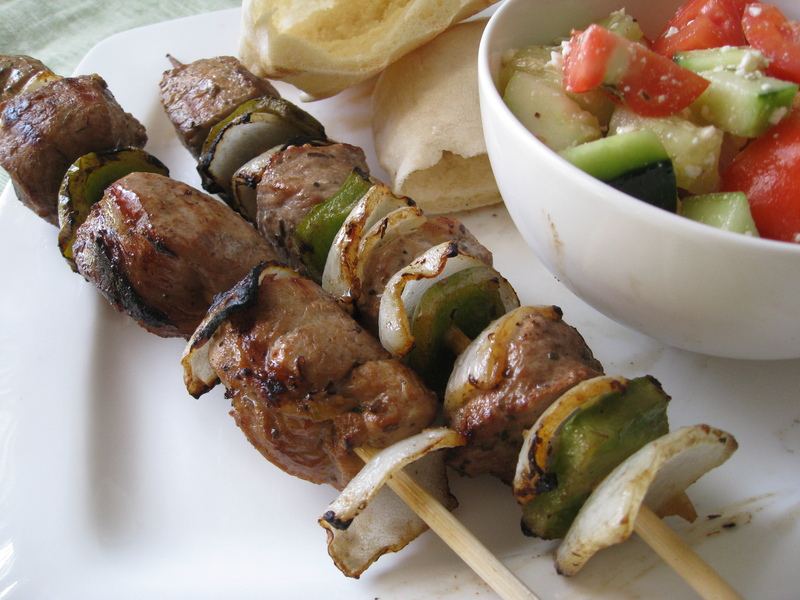 I just made souvlaki with chicken, now I am wanting to try it with pork thanks to your recipe. This looks great, I bet the soy sauce adds an interesting flavor.